Sheffield City Council has turned to the latest mapping and routing technology to improve Special Educational Needs (SEN) transport. The council, which provides transport for 1000 children to around 35 schools, has deployed cloud-based software from QRoutes to work out the best routes and optimise resources. The SEN fleet comprises 160 passenger vehicles and there are 300 drivers and passenger assistants on hand to deliver the service. Special Educational Needs transport is one of the primary services managed by Sheffield’s Transport and Facilities Management Department. Managing the service is particularly complex because of the varied requirements of passengers and the need to satisfy schools, parents and pupils, but within budget constraints dictated by the People/Schools Services Department. Sheffield’s SEN fleet includes a range of minibuses, as well as large specialist wheelchair lift vehicles that carry up to 16 passengers. The council also relies on outsourced taxi services to meet the service needs of around 130 passengers that fall beyond the scope or reach of the council-run fleet. 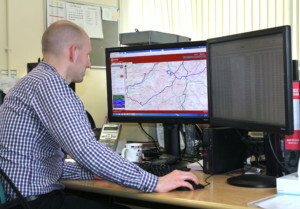 In the past Sheffield had used AutoRoute to plan SEN routes but the software had become outdated and no longer supported. In 2016 the decision was made to find a replacement and an appraisal was carried out of available systems. Sheffield trialled QRoutes during 2017 and started configuring the system to their requirements. The software is now being used and from June 2018 will be the department’s main routing system, planning and continually fine tuning approximately 145 routes. Its use is also being considered for areas such as social care and elections planning. “We can easily set different parameters such as maximum rides times at 40 and 50 minutes for a particular school. Revised plans can then be produced in seconds and we can switch and change parameters as much as we like to fine tune each plan. It takes about 30 seconds to run a plan and the system will give us an array of around 10 different solutions to consider – that would have taken days to do in the past” explains Keen. “Delivering SEN services is not easy as there are so many conflicting interests at play and every day we are dealing with many different personal requirements. In the end QRoutes is a tool that saves us a lot of time simulating different potential options and that frees us up to deal with all those pressing service issues” adds Keen.